Wakeboard speakers are the latest addition to the wakeboard experience. Music can bring a new life to any occasion or happening. The wake board speakers do just the same by adding a new sense of excitement to the sport. The speakers are usually attached to the wake board towers and that allows you to enjoy your favorite numbers, even when you are in water. It is the innovation in the design of the towers, which has really helped in having such a facility. The attachment point of the rope has allowed the space for tower accessories to be added. You will surely have a gala time by enjoying the excitement of wake boarding along with some exciting music. However, this was not possible before the advent of the tower speakers because it was a difficult job for any engineer to make a sound system that could be heard outside the boat. Moreover, even if you attached a music system, it used to take a lot of space. But with new technology, a music system can be attached even if your boat tower is swooped or arched. Therefore, if you are buying a tower, you must look whether it is pre-wired to accommodate these wake board speakers. Some of the towers are even equipped with technology that allows you to disconnect the wiring without much hassle. Therefore, wake board speakers won’t create any extra headache for you. However, when you are choosing a wakeboard speaker, you must consider the brand as well as the cost. You can also get a wake board speaker from local boat dealer or Internet. Each has advantages in its own way. When you are planning to buy a speaker from the local dealer, you will have the advantage of speaking to the person face to face and when you go for an online purchase, you will be aware of almost every option available. The final decision may be entirely based on quality, cost, company reputation but do not forget to check the different types of wake board audio with different features. A particular type of speaker uses Wide Dispersion Enhanced Throw Technology, which uses enhanced throw portion to deliver amazing volume with excellent quality to quite a distance. The best part of this genre of wakeboard audio are that the sound can be heard throughout a wide area. Most of the good and latest audio are also equipped with Quick Release Lockable Loudspeaker Connectors. Good audio are constructed with butyl rubber surround, polypropylene cone bodies, custom basket and a precision-tuned crossover network, provides a truly high quality sound. It is an effective outdoor sound system because the enclosure and speaker is designed to withstand the effects of the outdoor environment. There are other excellent wakeboard audio as well. Most of these audio are designed in the finest laboratories and they possess all the facilities needed to deliver clear and accurate sound back to the rider. Some audio are even designed with acoustic modeling so that they are able to produce sound that are of much higher quality and power, than regular car audio-based audio. After all, the rider deserves good quality sound from a wakeboard speaker to enjoy his ride. Go to Wakeboard Zone to get your free eBook about Wakeboarding at Wakeboard. Wakeboard Zone also has information on Wakeboard Speakers and a Wakeboarding Forum where you can connect with others who love Wakeboarding. You can Find your free eBook on Wakeboarding at wakeboardzone.org. If you are water sports buff, chances are very high that you would have used an O’Brien product at some point of time or the other. 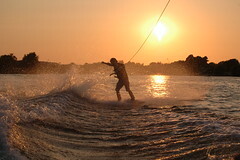 O’Brien has been manufacturing water sports products including O’Brien wakeboards for the past 47 years now. The sport has undergone a sea of change since 1962. Wooden planks were replaced by plastic which in turn have been replaced by light and extra strong carbon graphite and composite materials. In a world where a two or three year old product is considered obsolete, O’Brien wakeboards have retained their popularity for decades at a stretch. This is possible only because O’Brien has been successfully managing the transitions and has been offering what water sport participants and enthusiasts wanted. 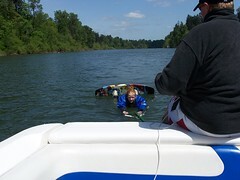 O’Brien wake boards are used for recreational as well as competitive sports. You need not spend a small fortune for purchasing your wake board as these wake boards, despite being high quality wake boards, are available at very affordable prices. Innovation and creativity are the buzzwords for O’Brien and this evident from the fact that the manufacturer has not just survived but has ruled the highly dynamic water sports market. Almost all wake boarding enthusiasts, whether they are experts or novices, prefer a ‘forgiving’ board. A board that does not help the rider work around technical wakeboarding errors will never become a popular board. This is because errors do occur and they are committed by even the best. A board that does not absorb the impact of a wrong stance while landing and which passes the impact to the knees and joints of the rider will be avoided. On the other hand, a board that is flexible enough to help the rider overcome the flaw is always preferred. A forgiving board never goes out of favor and O’Brien wake board have long established their reputation of being very forgiving wake board. O’Brien wake board are very light weight boards. However, these wake board do not suffer from the common flaw that is present in light boards- that the rider has to tolerate a hard impact when landing on the wake after completing the stunt. The O’Brien wake board are so designed that the individual will never face the problem of hard landings. The light weight enables the individual to get a great pop off the wake and this often gives the individual that extra second that is needed to perform the ‘impossible’ tricks. 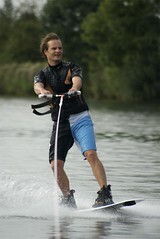 Despite having three stage rockers in most of its board, O’Brien wake board are very smooth even in choppy conditions. This makes it perfect for beginners who will always have control issues in the initial period. You can purchase all necessary accessories like vests and binders along with the O’Brien wake board from the same manufacturer. This ensures there are no compatibility problems during the ride. Further, you are assured of not just top quality O’Brien wake board but top quality O’Brien accessories as well. O’Brien wake boards are available in different sizes. Hence, you will never have to opt for an inferior quality board simply because you are overweight or underweight.